Welcome to the website of the Oregon State University Marine Sediment Sampling (MARSSAM) group. 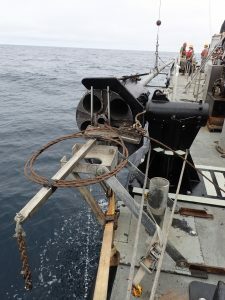 MARSSAM is the OSU coring and dredging facility providing marine geologic sampling services for US National Science Foundation (NSF) investigators using the UNOLS fleet and the USCG ice breaker R/V Healy, as well as international vessels supporting NSF research. Funding for these services is provided by the Ship Facilities Program at NSF. The OSU coring gear is among the best available in the United States, including large-volume and small-volume piston corers, box corers, kasten corers, and several multicorers and slow corers for undisturbed recovery of the sediment-water interface. Seagoing technicians from the facility have operated coring and dredging gear on most UNOLS vessels. We can also be engaged on a contract basis for non-NSF researchers and private entities requiring coring support. Services are customized to fit your needs, and can include use of hardware, personnel, deck handling gear, refrigerated shipping vans, sample describing materials, and permanent archival in the OSU Marine Geology Repository. For more information please access the drop-down menu on the upper right hand corner of the page, and/or contact us.